HAZWOPER training accessible by PC or mobile device. Fulfill your OSHA 29 CFR 1910.120 obligation and get or maintain your HAZWOPER certification! Training developed to fulfill OSHA 29 CFR 1910.120(e) and EPA 40 CFR 311 regulations for General Site Workers exposed to hazardous substances at or above Permissible Exposure Limits (PEL’s) during contaminated site cleanup. Designed for General Site Worker certification as defined by OSHA and EPA who are NOT exposed to hazardous substances at or above PEL’s. These professionals perform limited work tasks at hazardous waste sites. Course developed to meet annual HAZWOPER refresher requirements (re-certification) for workers conducting clean up operations at contaminated sites. Training must be completed on or before initial training anniversary date. 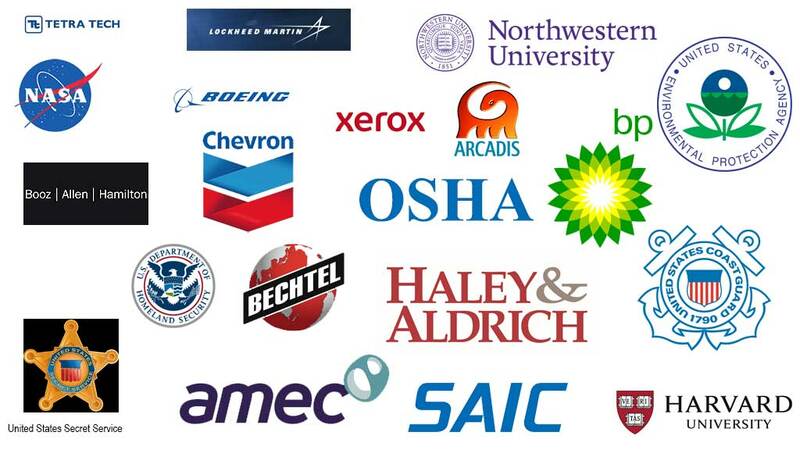 The U.S. Occupational Safety and Health Administration (OSHA) created the Hazardous Waste Operations and Emergency Response (HAZWOPER) regulation (Title 29 CFR Part 1910.120) to protect workers from exposure to hazardous substances during three types of work activities - general site cleanup, emergency response to chemical releases and the safe management of hazardous waste at facilities. While this regulation was far reaching in scope, it did not cover public sector employees who did not work in an OSHA approved Plan State. Specfically, volunteers, federal and state employees were not covered. Therefore, to cover these professionals, the U.S. Environmental Protection Agency (EPA) passed a very similar HAZWOPER regulation codified in Title 40 Part 311. This regulation extends to volunteers, public sector employees and provides a regulatory framework for their health and safety. 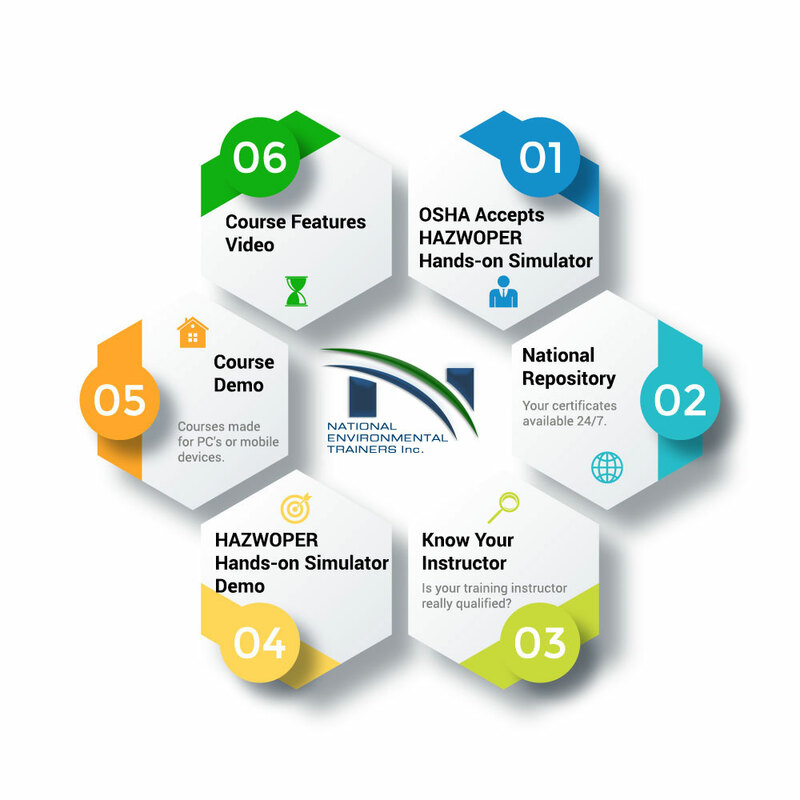 Our HAZWOPER courses are now mobile ready so you can scroll, swipe, tap, pinch or zoom, and click your way through an HTML5 course! 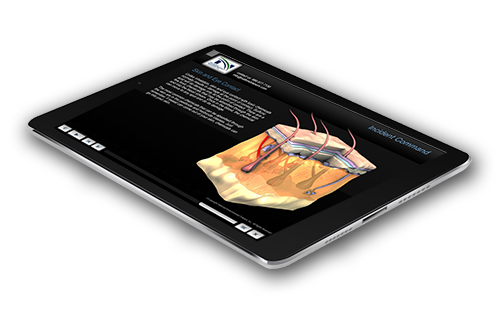 The new course format (responsive design) allows you to access our training via PC, laptop, iPad®, iPhone®, smart phones or any other mobile device. These are fully gesture enabled modules allowing you to use the latest technology combined with our OSHA compliant content. Our training uses multi-touch technology embedded in modern user interfaces that deliver training to you on the go or on a desktop. It does not matter which you device you use. You can change between devices and return to the same place where you left off. Our system will automatically detect your device and deliver the most appropriate experience for it. Experience the new method in training and you’ll be glad you did. Our new course format features all new content, stunning graphics, and more interactivity. Take us with you. Travel anywhere and access your training! What is a HAZWOPER Event? A HAZWOPER event occurs whenever any of the following scenarios below take place. An event is triggered by any of 3 scenarios listed in U.S. OSHA HAZWOPER regulations 29 CFR 1910.120 or EPA Protection of Environment regulations located in 40 CFR. A release of hazardous susbstance(s) occurs and emergency response operations are required for the release or substantial threats of releases of hazardous substances. This includes any releases or threats of releases from Resource Conservation and Recovery Act (RCRA) Treatment, Storage and Disposal Facilities (TSDFs). A site is contaminated and corrective action clean up and restoration is deemed necessary by the U.S. EPA RCRA regulations. Facilities that have an EPA Identification Number and a RCRA Part B permit will also have corrective action implications. Clean-up operations from contaminated sites as ordered by Federal, State or local governments. These typically occur at uncontrolled hazardous waste sites which include but not limited to sites placed on the National Priorities List (NPL) or state priority lists. This could also include initial and subsequent investigations to ascertain the scope, magnitude and extent of contamination at a site. Some of these clean-up operations can also be voluntary. Hazardous substances and products are stored in various containers, tanks and places at different facilities. It is not uncommon that products are stored in underground storage tanks, above ground storage tanks and drums. Hazardous substance releases can also occur on public highways, water, railways and from the air. Depending upon the nature of the response or clean up effort, different training is required for workers. So there are 3 main HAZWOPER events that can occur - emergency response, corrective action for a RCRA facility and clean up operations from contaminated sites. Which HAZWOPER Training Do I Need? In the event of an emergency response involving people who offensively engage in handling clean up operations they must be able to identify, react and control the situation to prevent a more serious problem. The initial training required for First Responders is HAZMAT Technician training. These offensive response personnel must have adequate OSHA training and be OSHA HAZWOPER Certified. If you are a person whose role is to receognize a release or threat of a release and call for First Responders, you will need either the HAZWOPER First Responder Operations or HAZWOPER First Responder Awareness training. Corrective action cleanup as mandated by U.S. EPA RCRA regulations require that a full assessment and characterization of a particular site be performed. This usually involves researching historical records, conducting interviews of employees and installing groundwater monitoring wells to fully delineate the contaminant plume. Personnel conducting work at these sites will initally need the 40 hour HAZWOPER or 24 hour HAZWOPER training. Clean up operations from abandoned sites or sites not under the regulatory purview of U.S. EPA RCRA regulations can also invoke a HAZWOPER event. These typically involve a lengthy clean up and restoration process as many of these sites are heavily contaminated. Depending upon the job function of an individual, different OSHA training is required. The same HAZWOPER training is required for personnel for this scenario as listed above for scenario 2. View list of HAZWOPER training requirements. OSHA has stated in many interpretation letters that 40 hour and 24 hour HAZWOPER sessions require site-specific hands-on learning on the actual Personal Protective Equipment (PPE) that an employee will be using in their job. Site-specific means just that. The training cannot be done with generic PPE, but must be done with the actual equipment in order to fully meet the OSHA regulations. The OSHA training requirements are listed below. A minimum of 24 or 40 hours of offsite instruction. Site-specific training on the actual PPE. A public seminar with people from different job sites cannot fulfill this requirement. Either 1 or 3 days of training under the direction of a qualified supervisor. Medical physical exam conducted by a fully licensed physician. The physical must also include a pulmonary function test of the lungs. Appropriate annual refresher training must be performed in order to maintain the certification status.